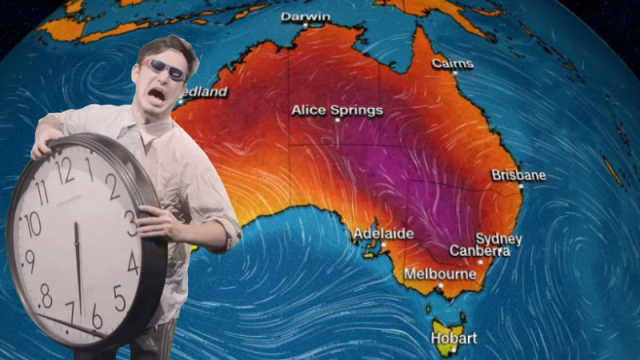 Well, we might have sweated through January’s record heatwave, but according to the BoM, February is set to be as equally testing. Yay. Well, my fellow sweaty citizens, we survived it, the hottest January recorded in a century of recording. To those who nobly stood against fans, or trekked across volcanic landscape to be cooled by a chilly library, or to those who chose to have their derma soaked by foreign urine in a public pool, or those who attempted to maintain a normal conversation over the hurricane drone of numerous fans; we made it. I mean, unless you’re a fish in Menindee, or a flying fox in Queensland. We made it. We’ll be telling our children about the summer when we survived days of a 30 degree mean average. I mean, probably not, as they’re going to suffer worse, but until that happens, the mantle is ours. We saw the highest temperate greet Port Augusta, and the highest minimum temperature batter Borrona Downs, a whopping 36.6 degrees. Typically, the hottest January followed the hottest December on record. The mean temperature of that month was 2.13 degrees above average, seeing record maximum temperatures tumble in every state bar Queensland and Tasmania. It’s fortunate that climate change isn’t real, hey. What I find rather frightening is our ability to cope. At some point, it’ll be too hot for us to handle, as the seas boil, rise and turn yellow, but as long as the fan doesn’t stop turning, and our complaint about the heat is noted, we’re a particularly hardy species. I know now why we bested the dinosaurs in our evolutionary game of chicken. We can endure. Which is fortunate, as Dr Andrew Watkins, the Bureau of Meteorology’s senior climatologist believes that February will be no different. “Odds are favouring that heat continuing at least through February, into March and April – odds of over 80 per cent that we’ll have warmer than normal days and nights as well,” Dr Watkins said.